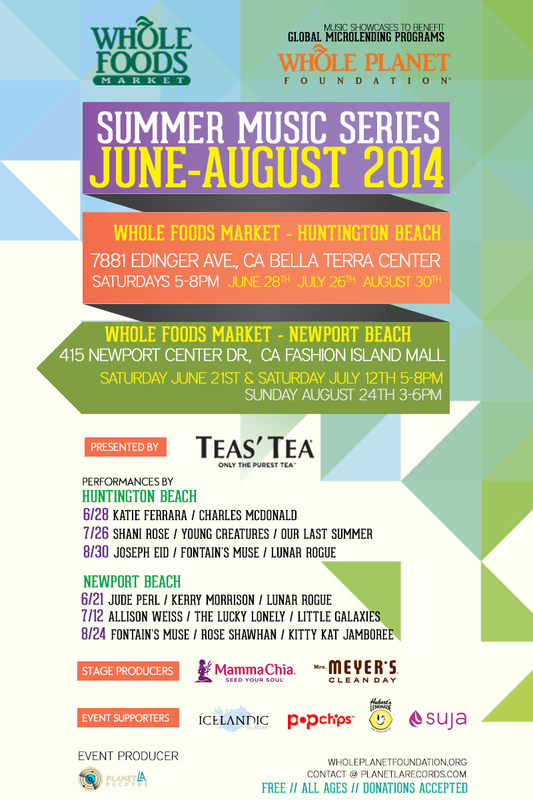 We are pleased to partner with Whole Foods Market to support the Whole Planet Foundation, featuring talented performers at Southern California locations from June to August, 2014. Free to attend, all ages and supporting a great cause! Special thanks to Presenting Sponsor Teas’ Tea, Stage Producers Mrs. Meyers Clean Day & Mamma Chia, Event Supporters Hubert’s Lemonade, Icelandic Glacial Water, popchips, Suja, Chameleon Cold Brew & more! Donations to support Whole Planet Foundation’s global microlending programs.